Today's So Shoe Me is the Hysteria Boot, $198, by and available at Free People. Add a pop of print and western flair into your pre-fall wardrobe. 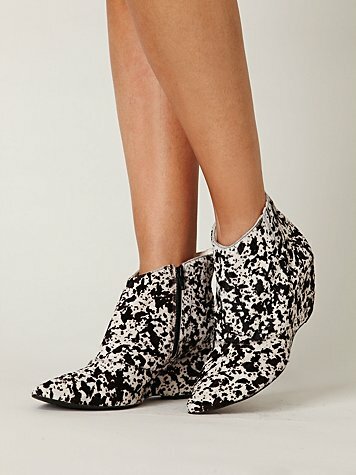 The must have ankle boot is making a bold statement in a modern black and white spotted print. a comfortable three inch wedge makes these boots ready for walking while the luxe cow hair adds a high end texture to your wardrobe. The pointed toe is on trend for fall and adds some casual country charm to this sleek ankle boot. Pair this patterned bootie with some sleek leather shorts and a distressed vintage tee for the perfect summer concert look. So Shoe Me a pair of boldly patterned ankle boots in a classic black and white color way that is perfect for casual days or fun filled nights.